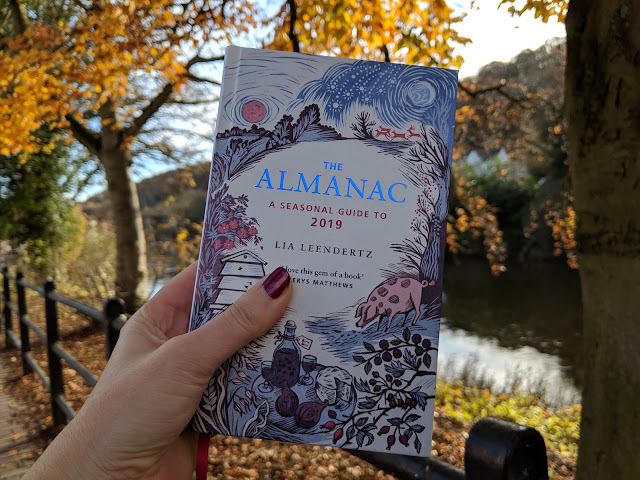 The Almanac - A Seasonal Guide to 2019 by Lia Leendertz, when I started to read this little book of loveliness I realised it was not a book you read and put down but one that stays with you through the year ahead. 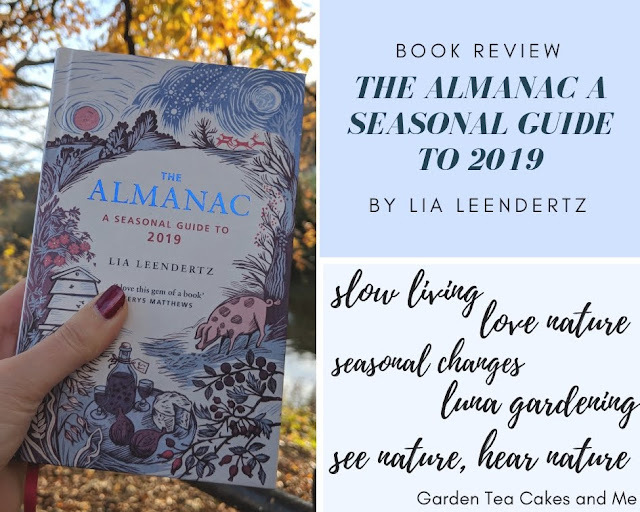 It contains more than just facts and information but provides inspiration, even a leading hand to helping the reader to see nature, the evening skies, and even your garden differently. This book will be by my side as the rain pours or the sun shines, as the days pass it will be my companion in the year ahead. The introduction of the book also helps you decide how the book can fit within your lifestyle, how much time, ability or even inclination you can spare. Lia describes it as a toolkit for the reader to pick out the elements that suit them, so for me I can not always embrace the high energy suggestions due to my physical disability. But that does not mean I can not enjoy or learn from them. The weather expectations and key ranges for temperature, rain, sun and length of day. There is also a table of sunrise and sunset times. Listing average sea temperatures and spring and neap tides, along with a table of high and low tides. I was most interested by The Sky at Night section, detailing what phases of the moon will be seen during the month. Which planets will be visible to the naked eye and where in the sky you will find them. I find it fascinating staring up into the evening sky, you will even find meteor showers listed. Now if only I could stay up long enough. Fruit and vegetables you can find in season at your greengrocers or ready for harvesting in your veg patch. You will also find cheese of the month in this section, along with a seasonal recipe or two. I am looking forward to making the Cherry Shandy suggested in August. Guidance for what to plant or harvest in accordance with the phase of the moon. Garden jobs of the month, glut of the months and flower of the month feature in this section. What sights and sounds you can expect to experience, from birds to insects to the crops in the farmers fields. Learn more about natives leaves and plants. Whenever I am outside or enjoying the view from the comfort of my garden room I always have an eye out for the birds. Even as I type this review, laptop balanced on my knee in the garden room I have a Crows harrying a Sparrow Hawk in the Copper Beech tree. A special mention to the beautiful illustrations throughout this book and particularly on the book cover all by Celia Hart. They are just heart warmingly divine. As I started to explore the contents of this most pleasing of books, I found myself jumping ahead to my birthday month just to see what my cheese of the month would be. Westcombe Ricotta, if you are as keen to know as I was, for cheese of the month is just one of interesting facts you will find in The Almanac. The Almanac - A Seasonal Guide to 2019 by Lia Leendertz is a hardback book priced £10 and is available from all good high street book shops and online. I want to thank Octopus books for supplying me with this much thought of book for review. I'm so pleased you love the illustrations.